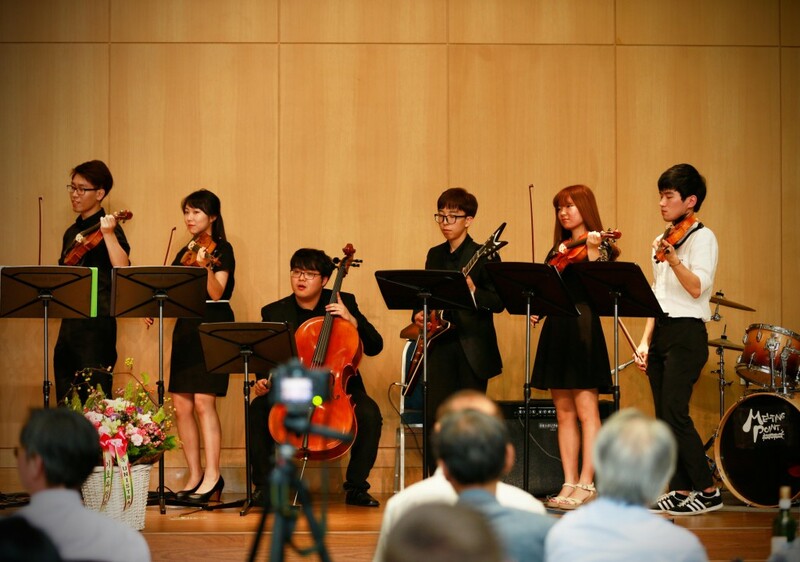 Conductor Jong Eun Lee (Division of General Studies), performing with UNISTRA members at the opening reception and ribbon ceremony on Sept. 8, 2015. UNISTra Opening Reception on Tuesday, Sept. 8th, 2015. On September, 8, 2015, a crowd of enthusiastic faculty, students, employees, and members of the community assembled to celebrate the official launching and ribbon cutting ceremony for the UNIST Symphony Orchestra (UNISTra). The UNIST Symphony Orchestra (UNISTra) was founded in 2012 by a small group of UNIST students. Under its conductor, Prof. Jong Eun Lee (Division of General Studies) the orchestra has successfully performed nearly 14 large symphonic works. “Throughout its short history, we have been working very hard to provide students and other members of the campus community with the opportunity to expand their musical talents, while at the same time presenting superb musical programs to the campus,” says Conductor Lee. 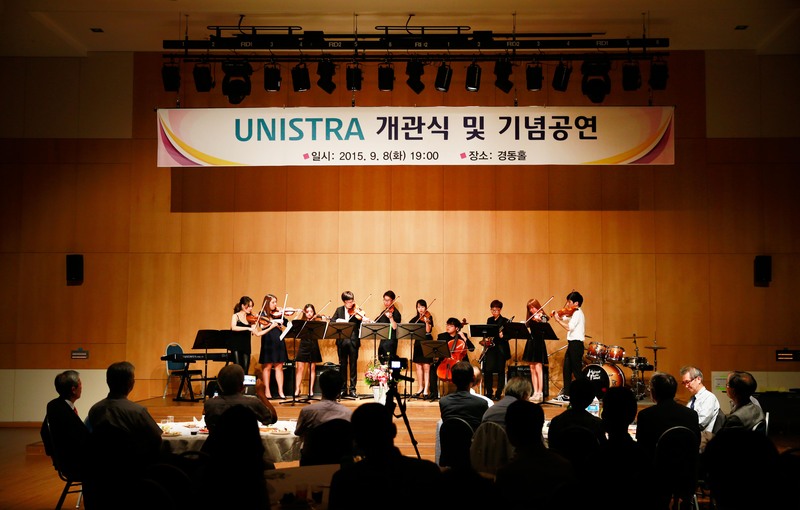 UNISTRA is performing at the opening reception under its conductor, Prof. Jong Eun Lee (Division of General Studies) on Sept. 8, 2015. A formal ribbon-cutting ceremony was followed by a special concert, featuring a variety of musical instruments including piano, strings, and brass to mark the official opening of UNISTra. 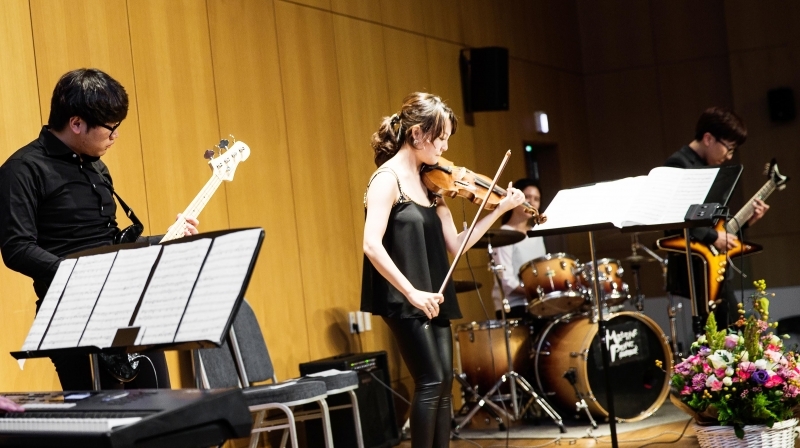 The opening concert was held in the new basement auditorium of UNIST Main Administration Building, featuring a special welcoming piano performance by Chair Prof. Kook Joe Shin (Division of General Studies).